scarce one Knowe'th ME in essence. Recognizing the truth of who and what we really are, is the key to finding meaning and joy in this life. It is the permanent solution to ending suffering. When a Being radiates that truth, through their own living-ness, whether they are in the body or not, its effects are extraordinarily powerful and all pervasive. 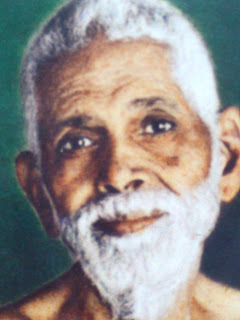 Sri Ramana Maharshi is the archetypal Guru of our times. Why, you might ask? Because in our age of technological advancement and complexity, his message is one of utter simplicity. Because the question; who am I? cuts through the divisions created by religion and race. Because, who am I? break down all the boundaries, placing before us, a truth that each and everyone of us can verify for ourselves, NOW. To recognize the fact of our Awareness! 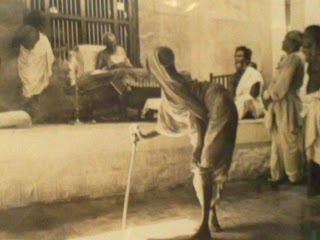 The Maharshi's life was a perfect manifestation of this living truth. His 'after-life,' is a testament to that which crosses the boundaries of time and space. Such have I known, Him of the lustrous eyes, Him whose sole look pierced to the heart, of wisdom deeper than the holy book, of Truth alone.